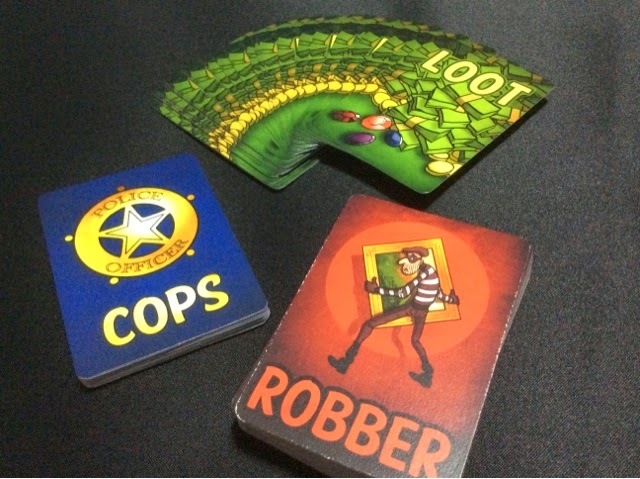 Cops & Robbers is a family/party style push your luck game where players are robbers trying to steal the most cash in a stipulated amount of time or to steal a pre agreed amount of cash. The robber that is able to accomplish this is the winner of the game. The Cop card deck comprises of cop cards of various numbers (0-3) and also the very frustrating "caught" card; of which that player is usually immediately sent to jail (only avoidable by a special action card). 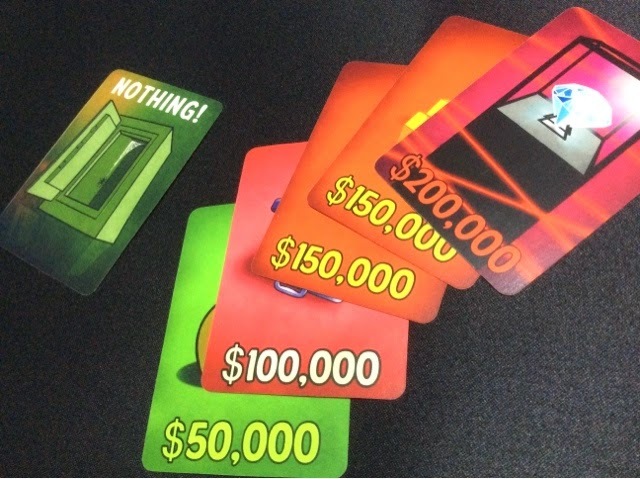 These cards are only used when the players are attempting to stash their loot. The last deck is the Loot card deck. This deck contains all the loot that the players are trying to steal. The range of the loot are from nothing! to $200,000. 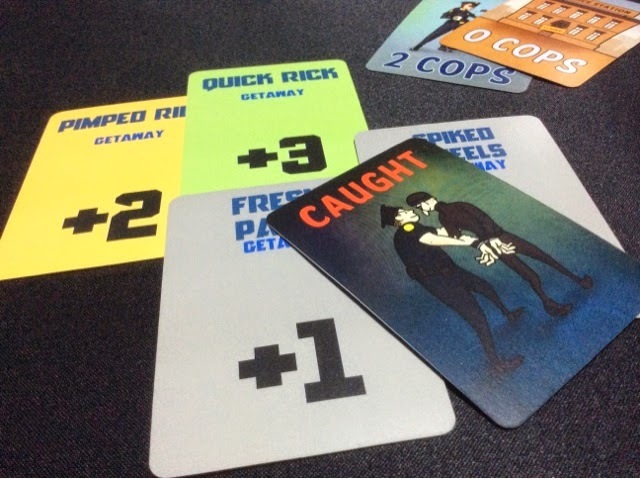 Cops & Robbers has a very easy to learn rule set. That's it! This carries on till someone has stashed the pre agreed amount of loot or until the pre set amount of time has passed. Then players look around the table to see who has won and proceed to blame each other on why he/she did not manage to pull out the win. Haha. During this phase, players are usually playing their getaway cards to pimp their ride. Each player's ride may only consist a maximum of 4 cards - a car, a driver, and 2 upgrades. Other cards that may be played during this phase are those that steal items or loot from other players, or to apply certain actions on yourself or other players. This action is similar to the lie low action, but instead of drawing 2 robber cards, the player draws 1 robber card and 1 loot card instead. The loot card is kept secret from the other players. Likewise, after drawing the cards, the player may play as many cards as he/she so desires. The loot card drawn during this action is not considered stashed. Therefore it does not count towards the amount that the player has stolen. This third action is executed only when a player has loot cards in front of him/her from previous loot actions. If the player has no loot card, he/she may not execute the stash action. When performing this action, the player draws as many cop cards as the amount of loot the player has. This is the amount of cops the player is trying to escape from so that his/her loot may be successfully stashed. If the player draws the caught! card, then he/she immediately goes to jail without a chance to do a proper getaway. Ready for a Getaway !! If the caught! card is not drawn, play will proceed to the getaway phase of the game. During this phase, the escaping player will count the positive numbers he/she has from his/her pimped ride. This is the total that the player has to outrun the cops. Play then goes in clockwise order where players may play the one use cards to influence the outcome of the getaway. Generally speaking - I guess this doesn't even need to be said - the active player is playing the positive one use cards to increase his/her escape total and other players are playing the negative one use cards to prevent the player from successfully escaping. Once a player passes on playing a card, that player may not come back into the round to play more one use cards. 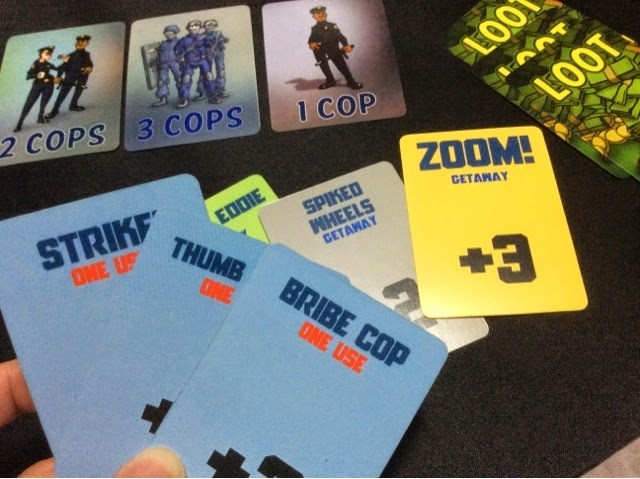 If by the time play comes back to the active player and his/her total meets or exceeds the total value of the drawn cop cards, then the player has successfully stashed his/her loot. The player's turn then ends. If the player is unsuccessful in escaping or if the caught! card is drawn, then the player loses all the loot and all of his/her getaway equipment (car, driver, upgrades). The player is in jail till their next turn. 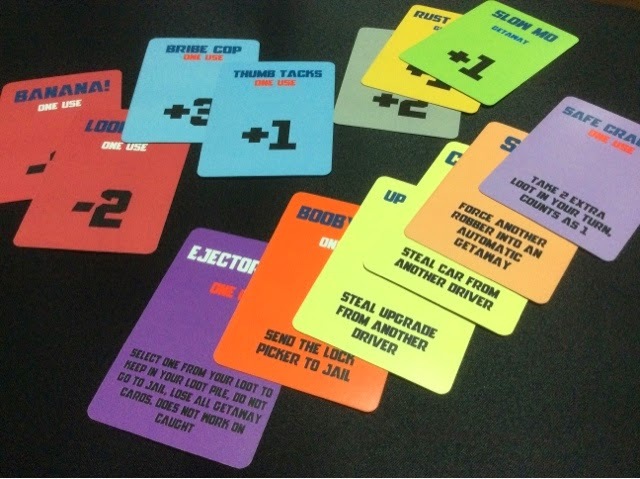 While in jail, the player may not play any robber cards. So the player may not participate in foiling the escape of another player till his/her next turn comes around. So, what do I think of the game? Well, that being said, the flow of Cops & Robbers is smooth and seamless from start to finish. This is thanks to how simple it is to learn and understand. There were some questions about the cards but those were quickly answered. The theme of the game is also very easy to get into. It is reminiscence of the bank robbery and car chase scenes that you see on the movie screens (but without guns and explosions). In fact, I think the theme of the game really carries it a long way. Just playing the prototype without finished art, my group was able to invoke the theme from within and carry it with them through multiple plays. I can imagine how with finished art, the theme will strike through even more convincingly and increase the level of enjoyment that one gets from playing the game. That doesn't mean that the gameplay is not on par with the theme. In fact, my groups have both enjoyed the game very much. There was much laughter, accusations, and curses flying across the table. Because each player will always attempt a getaway and usually always fail at least once, so there is a lot of payback you can expect when play comes back to you. Previous failures are not forgotten and future success never guaranteed. All in all, our plays of Cops & Robbers have gone well with most at the table. Some agree that the game was fun and worth a revisit, others have simply taken the cards and shuffled them ready for game number 2 and subsequently 3. It's kind of like a bite size push your luck and take that game. The game is not without some minor annoyances though, I'm not sure if they will be addressed in the Kickstarter release, but what we have found is that sometimes the game may take longer than expected. Either from drawing low valued cards, or just from constant foiling of plans. Lastly, in case you haven't realized by now, this is a take that style game. No two ways about it. It's about tripping your friends over and laughing when they are down. If your group isn't into these type of games, then this is most certainly not for you. It's not nasty by any means really, it's all light hearted take that all the way, but just a note for those with over sensitive friends. So if the game sounds like something you would be interested in, do check out the Kickstarter for the game. The link can be found at the top of this post! No Wines, Much War, Wow Indians !